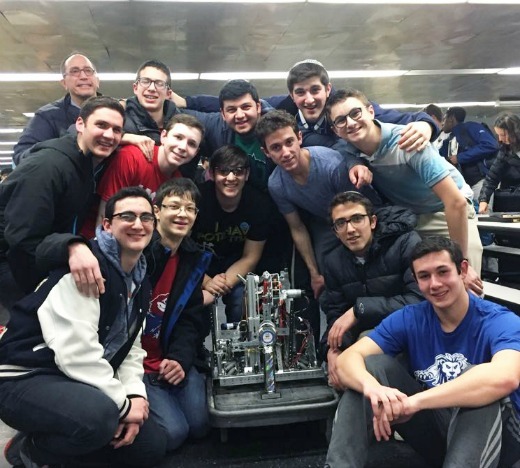 On December 10 and January 14 two robotics teams, Lionotics and Lionotics 2, from the Marsha Stern Talmudical Academy/Yeshiva University High School for Boys (YUHSB), came out as leaders in a competition organized by FIRST Tech Challenge (FTC). The robotic team program was formed seven years ago under the guidance of Reuven Levy, and two years ago the program got a tremendous vote of confidence from the Gruss Foundation’s $191,000 donation to YUHSB to create a new STEM (science, technology, engineering and math) lab, including a dedicated robotics room with specialized tools and equipment. FTC was founded by Dean Kamen, engineer, inventor and businessman, best known for inventing the Segway personal vehicle. Kamen launched FTC in order to “inspire young people to be science and technology leaders and innovators [by engaging in] exciting, mentor-based, research and robotics programs,” according to the organization’s website. Each FTC robotics competition challenges teams to accomplish a series of tasks, such as moving large blocks or balancing on balance boards, and to do so with their robots operating both autonomously and with human guidance. The teams have to go through local and regional qualifying rounds in order to be eligible for the final championship. Many students participated in building the winning robots. Hardware captain, G.J. Nieman (senior), oversaw the work on both robots. Seniors Hanan Berger, Dov Tuchman and Yaakov Kagansky helped build the robots. Many sophomores and juniors also contributed, specifically: Netanel Tager, David Kohanchi, Sammy Cohen, Akiva Richman, Daniel Rosenfeld, Elishama Marmon, Zach Mankowitz and Gavi Berman. On the software side, seniors Benny Jacob and Aryeh Greenberg wrote the programs. Both teams participated in qualifiers on December 10 and January 14. On December 10, Lionotics came in first at the qualifier held at the John Dewey High School in Brooklyn. On January 14, Lionotics 2 placed first at the qualifier held at Francis Lewis High School in Queens. The next stage of the competition will be held at Townsend Harris High School, also in Queens, on February 25.